The best project for beginners is the fountain. Fountains are cardboard tubes with a core of fountain composition pressed into them, ignited by a piece of Visco, Black Match, or similar fuse. An ordinary sparkler will work as a fuse, if you cannot get either of these items (visco etc. ), but is of limited use as fuse in other pyrotechnic devices, so getting hold of a supply of Visco (perhaps from Skylighter) or Black Match (which can be easily made) will be essential once you start making other devices. There are two types of fountains: choked and unchoked. 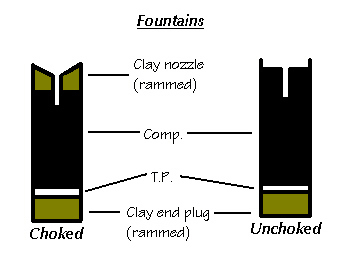 An unchoked fountain is a fountain with one end entirely opened, whilst a choked fountain has a nozzle, usually made out of clay (see below diagram). To make a fountain, one must first have a cardboard tube. You could roll your own tubes, or you could use the tube from the center of the Glad Cling Wrap (which are very hard, big, and cheap if you buy the 30 meter varieties and just remove the Glad Wrap ;-) or a fax paper roll (which are also very good). Next, buy a 1 meter piece of wooden dowel. Make sure that the dowel just fits (ie, is the same diameter as the inner diameter of your cardboard tube) by sliding the tube over the dowel when you're at the hardware store. Next, obtain some potassium nitrate. It is available at hydroponics and garden stores and is used as a water-soluble potash/nitrogen fertilizer. Then, obtain some lump charcoal (not the briquettes, the briquettes are bound with clay which impedes their perfomance). The lump charcoal is somewhat more black than the briquettes are. Next, obtain some icing sugar, some kitty litter, and a weighing scale (these are sold as diet scales in kitchen stores; make sure you get one with at least +/- 2 gram accuracy). First, place the tube one end down onto a piece of plywood or similar object. Pour in some kitty litter, and then insert the dowel (cut it into 30 centimeter pieces beforehand), and strike the dowel about ten times with a rubber or wooden mallot with lots of force (but try not to split the tube!). Then, place the lump charcoal in a ziplock bag, and hit it with another piece of dowel until it is composed of little particles about the size of cereal crumbs or bread crumbs. Then, weigh out 35 parts by weight of potassium nitrate, and mix it with 15 parts by weight of icing sugar (mix it thouroughly by placing it in a snap-lid plastic container [such as a margarine container] and shaking the capped container for a couple of minutes). Next, weigh out 25 parts by weight of the charcoal crumbs, and again mix it well. Next, pour this mixture into the cardboard tube, and insert the dowel, and press the mixed composition as well as you can with hand pressure. Keep adding more composition and pressing until only 1 inch of the tube is not yet filled. You now have a choice to just ignite the fountain as is (thereby making it an unchoked fountain), or to ram some more kitty litter into the remaining inch of tube, and drill a hole 1/2 the diameter of the tube (by hand!) in the resulting end plug, to produce a choked fountain. However, when you're starting out, it is best to start off with unchoked fountains and work your way up to choked. Have fun with your fountains! Here is a schematic of both fountain types.